The Cassini–Huygens mission (/kəˈsiːni ˈhɔɪɡənz/ kə-SEE-nee HOY-gənz), commonly called Cassini, was a collaboration between NASA, the European Space Agency (ESA), and the Italian Space Agency (ASI) to send a probe to study the planet Saturn and its system, including its rings and natural satellites. The Flagship-class robotic spacecraft comprised both NASA's Cassini probe, and ESA's Huygens lander which landed on Saturn's largest moon, Titan. Cassini was the fourth space probe to visit Saturn and the first to enter its orbit. The craft were named after astronomers Giovanni Cassini and Christiaan Huygens. Launched aboard a Titan IVB/Centaur on October 15, 1997, Cassini was active in space for nearly 20 years, with 13 years spent orbiting Saturn, studying the planet and its system after entering orbit on July 1, 2004. The voyage to Saturn included flybys of Venus (April 1998 and July 1999), Earth (August 1999), the asteroid 2685 Masursky, and Jupiter (December 2000). Its mission ended on September 15, 2017, when Cassini's trajectory took it into Saturn's upper atmosphere and it burned up in order to prevent any risk of contaminating Saturn's moons, which might have offered habitable environments to stowaway terrestrial microbes on the spacecraft. The mission is widely perceived to have been successful beyond expectation. Cassini-Huygens has been described by NASA's Planetary Science Division Director as a "mission of firsts", that has revolutionized human understanding of the Saturn system, including its moons and rings, and our understanding of where life might be found in the Solar System. Cassini's original mission was planned to last for four years, from June 2004 to May 2008. The mission was extended for another two years until September 2010, branded the Cassini Equinox Mission. The mission was extended a second and final time with the Cassini Solstice Mission, lasting another seven years until September 15, 2017, on which date Cassini was de-orbited to burn up in Saturn's upper atmosphere. The Huygens module traveled with Cassini until its separation from the probe on December 25, 2004; it was landed by parachute on Titan on January 14, 2005. It returned data to Earth for around 90 minutes, using the orbiter as a relay. This was the first landing ever accomplished in the outer Solar System and the first landing on a moon other than Earth's Moon. At the end of its mission, the Cassini spacecraft executed the "Grand Finale" of its mission: a number of risky passes through the gaps between Saturn and Saturn's inner rings. The purpose of this phase was to maximize Cassini's scientific outcome before the spacecraft was disposed. The atmospheric entry of Cassini ended the mission, but analyses of the returned data will continue for many years. Teams from 28 countries made up the joint team responsible for designing, building, flying and collecting data from the Cassini orbiter and Huygens probe. The mission was managed by NASA's Jet Propulsion Laboratory in the United States, where the orbiter was assembled. Huygens was developed by the European Space Research and Technology Centre. The Centre's prime contractor, Aérospatiale of France (now Thales Alenia Space), assembled the probe with equipment and instruments supplied by many European countries (Huygens' batteries and two scientific instruments by the United States). The Italian Space Agency (ASI) provided the Cassini orbiter's high-gain radio antenna, with the incorporation of a low-gain antenna (to ensure telecommunications with the Earth for the entire duration of the mission), a compact and lightweight radar, which also uses the high-gain antenna and serves as a synthetic-aperture radar, a radar altimeter, a radiometer, the radio science subsystem (RSS), the visible channel portion VIMS-V of VIMS spectrometer. The VIMS infrared counterpart was provided by NASA, as well as Main Electronic Assembly, which includes electronic subassemblies provided by CNES of France. On April 16, 2008, NASA announced a two-year extension of the funding for ground operations of this mission, at which point it was renamed the Cassini Equinox Mission. The round of funding was again extended in February 2010 with the Cassini Solstice Mission. The mission consisted of two main elements: the ASI/NASA Cassini orbiter, named for the Italian astronomer Giovanni Domenico Cassini, discoverer of Saturn's ring divisions and four of its satellites; and the ESA-developed Huygens probe, named for the Dutch astronomer, mathematician and physicist Christiaan Huygens, discoverer of Titan. The mission was commonly called Saturn Orbiter Titan Probe (SOTP) during gestation, both as a Mariner Mark II mission and generically. Cassini-Huygens was a Flagship-class mission to the outer planets. The other planetary flagships include Galileo, Voyager, and Viking. Determining the three-dimensional structure and dynamic behavior of the rings of Saturn. Determining the composition of the satellite surfaces and the geological history of each object. Determining the nature and origin of the dark material on Iapetus's leading hemisphere. Measuring the three-dimensional structure and dynamic behavior of the magnetosphere. Studying the dynamic behavior of Saturn's atmosphere at cloud level. Studying the time variability of Titan's clouds and hazes. Characterizing Titan's surface on a regional scale. Cassini–Huygens was launched on October 15, 1997, from Cape Canaveral Air Force Station's Space Launch Complex 40 using a U.S. Air Force Titan IVB/Centaur rocket. 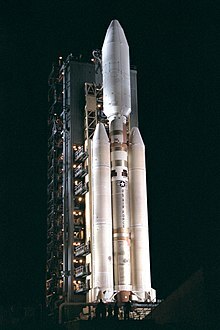 The complete launcher was made up of a two-stage Titan IV booster rocket, two strap-on solid rocket engines, the Centaur upper stage, and a payload enclosure, or fairing. The total cost of this scientific exploration mission was about US$3.26 billion, including $1.4 billion for pre-launch development, $704 million for mission operations, $54 million for tracking and $422 million for the launch vehicle. The United States contributed $2.6 billion (80%), the ESA $500 million (15%), and the ASI $160 million (5%). However, these figures are from the press kit which was prepared in October 2000. They do not include inflation over the course of a very long mission, nor do they include the cost of the extended missions. The primary mission for Cassini was completed on July 30, 2008. The mission was extended to June 2010 (Cassini Equinox Mission). This studied the Saturn system in detail during the planet's equinox, which happened in August 2009. On February 3, 2010, NASA announced another extension for Cassini, lasting 6​1⁄2 years until 2017, ending at the time of summer solstice in Saturn's northern hemisphere (Cassini Solstice Mission). The extension enabled another 155 revolutions around the planet, 54 flybys of Titan and 11 flybys of Enceladus. In 2017, an encounter with Titan changed its orbit in such a way that, at closest approach to Saturn, it was only 3,000 km above the planet's cloudtops, below the inner edge of the D ring. This sequence of "proximal orbits" ended when its final encounter with Titan sent the probe into Saturn's atmosphere to be destroyed. Cassini–Huygens's origins date to 1982, when the European Science Foundation and the American National Academy of Sciences formed a working group to investigate future cooperative missions. Two European scientists suggested a paired Saturn Orbiter and Titan Probe as a possible joint mission. In 1983, NASA's Solar System Exploration Committee recommended the same Orbiter and Probe pair as a core NASA project. NASA and the European Space Agency (ESA) performed a joint study of the potential mission from 1984 to 1985. ESA continued with its own study in 1986, while the American astronaut Sally Ride, in her influential 1987 report NASA Leadership and America's Future in Space, also examined and approved of the Cassini mission. While Ride's report described the Saturn orbiter and probe as a NASA solo mission, in 1988 the Associate Administrator for Space Science and Applications of NASA, Len Fisk, returned to the idea of a joint NASA and ESA mission. He wrote to his counterpart at ESA, Roger Bonnet, strongly suggesting that ESA choose the Cassini mission from the three candidates at hand and promising that NASA would commit to the mission as soon as ESA did. At the time, NASA was becoming more sensitive to the strain that had developed between the American and European space programs as a result of European perceptions that NASA had not treated it like an equal during previous collaborations. NASA officials and advisers involved in promoting and planning Cassini–Huygens attempted to correct this trend by stressing their desire to evenly share any scientific and technology benefits resulting from the mission. In part, this newfound spirit of cooperation with Europe was driven by a sense of competition with the Soviet Union, which had begun to cooperate more closely with Europe as ESA drew further away from NASA. Late in 1988, ESA chose Cassini–Huygens as its next major mission and the following year the program received major funding in the US. The collaboration not only improved relations between the two space programs but also helped Cassini–Huygens survive congressional budget cuts in the United States. 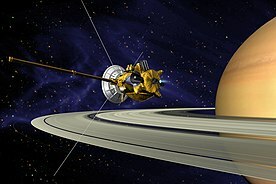 Cassini–Huygens came under fire politically in both 1992 and 1994, but NASA successfully persuaded the United States Congress that it would be unwise to halt the project after ESA had already poured funds into development because frustration on broken space exploration promises might spill over into other areas of foreign relations. The project proceeded politically smoothly after 1994, although citizens' groups concerned about its potential environmental impact attempted to derail it through protests and lawsuits until and past its 1997 launch. The spacecraft was planned to be the second three-axis stabilized, RTG-powered Mariner Mark II, a class of spacecraft developed for missions beyond the orbit of Mars. Cassini was developed simultaneously with the Comet Rendezvous Asteroid Flyby (CRAF) spacecraft, but budget cuts and project rescopings forced NASA to terminate CRAF development to save Cassini. As a result, Cassini became more specialized. The Mariner Mark II series was cancelled. The combined orbiter and probe is the third-largest unmanned interplanetary spacecraft ever successfully launched, behind the Phobos 1 and 2 Mars probes, as well as being among the most complex. The orbiter had a mass of 2,150 kg (4,740 lb), the probe 350 kg (770 lb). With the launch vehicle adapter and 3,132 kg (6,905 lb) of propellants at launch, the spacecraft had a mass of 5,600 kg (12,300 lb). The Cassini spacecraft was 6.8 meters (22 ft) high and 4 meters (13 ft) wide. Spacecraft complexity was increased by its trajectory (flight path) to Saturn, and by the ambitious science at its destination. Cassini had 1,630 interconnected electronic components, 22,000 wire connections, and 14 kilometers (8.7 mi) of cabling. The core control computer CPU was a redundant MIL-STD-1750A system. The main propulsion system consisted of one prime and one backup R-4D bipropellant rocket engine. The thrust of each engine was 490 newtons and the total spacecraft delta-v was about 2,040 meters per second. Smaller monopropellant rockets provided attitude control. Cassini was powered by 32.7 kg of plutonium-238—the heat from the material's radioactive decay was turned into electricity. Huygens was supported by Cassini during cruise, but used chemical batteries when independent. The probe contained a DVD with more than 616,400 signatures from citizens in 81 countries, collected in a public campaign. Until September 2017 the Cassini probe continued orbiting Saturn at a distance of between 8.2 and 10.2 astronomical units from the Earth. It took 68 to 84 minutes for radio signals to travel from Earth to the spacecraft, and vice versa. Thus ground controllers could not give "real-time" instructions for daily operations or for unexpected events. Even if response were immediate, more than two hours would have passed between the occurrence of a problem and the reception of the engineers' response by the satellite. Cassini's instrumentation consisted of: a synthetic aperture radar mapper, a charge-coupled device imaging system, a visible/infrared mapping spectrometer, a composite infrared spectrometer, a cosmic dust analyzer, a radio and plasma wave experiment, a plasma spectrometer, an ultraviolet imaging spectrograph, a magnetospheric imaging instrument, a magnetometer and an ion/neutral mass spectrometer. Telemetry from the communications antenna and other special transmitters (an S-band transmitter and a dual-frequency Ka-band system) was also used to make observations of the atmospheres of Titan and Saturn and to measure the gravity fields of the planet and its satellites. CAPS was an in situ instrument that measured the flux of charged particles at the location of the spacecraft, as a function of direction and energy. The ion composition was also measured using a time-of-flight mass spectrometer. CAPS measured particles produced by ionisation of molecules originating from Saturn's and Titan's ionosphere, as well as the plumes of Enceladus. CAPS also investigated plasma in these areas, along with the solar wind and its interaction with Saturn's magnetosphere. CAPS was turned off in June 2011, as a precaution due to a "soft" electrical short circuit that occurred in the instrument. It was powered on again in March 2012, but after 78 days another short circuit forced the instrument to be shut down permanently. The CDA was an in situ instrument that measured the size, speed, and direction of tiny dust grains near Saturn. It could also measure the grains' chemical elements. Some of these particles orbited Saturn, while others came from other star systems. The CDA on the orbiter was designed to learn more about these particles, the materials in other celestial bodies and potentially about the origins of the universe. The CIRS was a remote sensing instrument that measured the infrared radiation coming from objects to learn about their temperatures, thermal properties, and compositions. 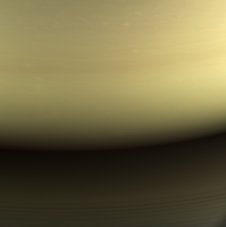 Throughout the Cassini–Huygens mission, the CIRS measured infrared emissions from atmospheres, rings and surfaces in the vast Saturn system. It mapped the atmosphere of Saturn in three dimensions to determine temperature and pressure profiles with altitude, gas composition, and the distribution of aerosols and clouds. It also measured thermal characteristics and the composition of satellite surfaces and rings. The INMS was an in situ instrument that measured the composition of charged particles (protons and heavier ions) and neutral particles (atoms and molecules) near Titan and Saturn to learn more about their atmospheres. The instrument used a quadrupole mass spectrometer. INMS was also intended to measure the positive ion and neutral environments of Saturn's icy satellites and rings. The ISS was a remote sensing instrument that captured most images in visible light, and also some infrared images and ultraviolet images. The ISS took hundreds of thousands of images of Saturn, its rings, and its moons. The ISS had both a wide-angle camera (WAC) and a narrow-angle camera (NAC). Each of these cameras used a sensitive charge-coupled device (CCD) as its electromagnetic wave detector. Each CCD had a 1,024 square array of pixels, 12 μm on a side. Both cameras allowed for many data collection modes, including on-chip data compression, and were fitted with spectral filters that rotated on a wheel to view different bands within the electromagnetic spectrum ranging from 0.2 to 1.1 μm. The MAG was an in situ instrument that measured the strength and direction of the magnetic field around Saturn. The magnetic fields are generated partly by the molten core at Saturn's center. Measuring the magnetic field is one of the ways to probe the core. MAG aimed to develop a three-dimensional model of Saturn's magnetosphere, and determine the magnetic state of Titan and its atmosphere, and the icy satellites and their role in the magnetosphere of Saturn. The MIMI was both an in situ and remote sensing instrument that produces images and other data about the particles trapped in Saturn's huge magnetic field, or magnetosphere. The in situ component measured energetic ions and electrons while the remote sensing component (the Ion And Neutral Camera, INCA) was an energetic neutral atom imager. This information was used to study the overall configuration and dynamics of the magnetosphere and its interactions with the solar wind, Saturn's atmosphere, Titan, rings, and icy satellites. The on-board radar was an active and passive sensing instrument that produced maps of Titan's surface. Radar waves were powerful enough to penetrate the thick veil of haze surrounding Titan. By measuring the send and return time of the signals it is possible to determine the height of large surface features, such as mountains and canyons. The passive radar listened for radio waves that Saturn or its moons may emit. The RPWS was an in situ instrument and remote sensing instrument that receives and measures radio signals coming from Saturn, including the radio waves given off by the interaction of the solar wind with Saturn and Titan. RPWS measured the electric and magnetic wave fields in the interplanetary medium and planetary magnetospheres. It also determined the electron density and temperature near Titan and in some regions of Saturn's magnetosphere using either plasma waves at characteristic frequencies (e.g. the upper hybrid line) or a Langmuir probe. RPWS studied the configuration of Saturn's magnetic field and its relationship to Saturn Kilometric Radiation (SKR), as well as monitoring and mapping Saturn's ionosphere, plasma, and lightning from Saturn's (and possibly Titan's) atmosphere. The RSS was a remote-sensing instrument that used radio antennas on Earth to observe the way radio signals from the spacecraft changed as they were sent through objects, such as Titan's atmosphere or Saturn's rings, or even behind the Sun. The RSS also studied the compositions, pressures and temperatures of atmospheres and ionospheres, radial structure and particle size distribution within rings, body and system masses and the gravitational field. The instrument used the spacecraft X-band communication link as well as S-band downlink and Ka-band uplink and downlink. VIMS spectra taken while looking through Titan's atmosphere towards the Sun helped understand the atmospheres of exoplanets (artist's concept; May 27, 2014). The UVIS was a remote-sensing instrument that captured images of the ultraviolet light reflected off an object, such as the clouds of Saturn and/or its rings, to learn more about their structure and composition. Designed to measure ultraviolet light over wavelengths from 55.8 to 190 nm, this instrument was also a tool to help determine the composition, distribution, aerosol particle content and temperatures of their atmospheres. Unlike other types of spectrometer, this sensitive instrument could take both spectral and spatial readings. It was particularly adept at determining the composition of gases. Spatial observations took a wide-by-narrow view, only one pixel tall and 64 pixels across. The spectral dimension was 1,024 pixels per spatial pixel. It could also take many images that create movies of the ways in which this material is moved around by other forces. The VIMS was a remote sensing instrument that captured images using visible and infrared light to learn more about the composition of moon surfaces, the rings, and the atmospheres of Saturn and Titan. It consisted of two cameras - one used to measure visible light, the other infrared. VIMS measured reflected and emitted radiation from atmospheres, rings and surfaces over wavelengths from 350 to 5100 nm, to help determine their compositions, temperatures and structures. 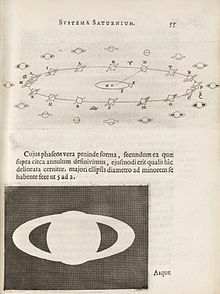 It also observed the sunlight and starlight that passes through the rings to learn more about their structure. Scientists used VIMS for long-term studies of cloud movement and morphology in the Saturn system, to determine Saturn's weather patterns. To gain momentum while already in flight, the trajectory of the Cassini mission included several gravitational slingshot maneuvers: two fly-by passes of Venus, one more of the Earth, and then one of the planet Jupiter. The terrestrial flyby was the final instance when the probe posed any conceivable danger to human beings. The maneuver was successful, with Cassini passing by 1,171 km (728 mi) above the Earth on August 18, 1999. Had there been any malfunction causing the probe to collide with the Earth, NASA's complete environmental impact study estimated that, in the worst case (with an acute angle of entry in which Cassini would gradually burn up), a significant fraction of the 33 kg of plutonium-238 inside the RTGs would have been dispersed into the Earth's atmosphere so that up to five billion people (i.e. almost the entire terrestrial population) could have been exposed, causing up to an estimated 5,000 additional cancer deaths over the subsequent decades (0.0005 per cent, i.e. a fraction 0.000005, of a billion cancer deaths expected anyway from other causes; the product is incorrectly calculated elsewhere as 500,000 deaths). However, the chance of this happening were estimated to be less than one in one million. The Cassini spacecraft was capable of transmitting in several different telemetry formats. The telemetry subsystem is perhaps the most important subsystem, because without it there could be no data return. The telemetry was developed from ground up, due to the spacecraft using a more modern set of computers than previous missions. Therefore, Cassini was the first spacecraft to adopt mini-packets to reduce the complexity of the Telemetry Dictionary, and the software development process led to the creation of a Telemetry Manager for the mission. There were around 1088 channels (in 67 mini-packets) assembled in the Cassini Telemetry Dictionary. Out of these 67 lower complexity mini-packets, 6 mini-packets contained the subsystem covariance and Kalman gain elements (161 measurements), not used during normal mission operations. This left 947 measurements in 61 mini-packets. A total of seven telemetry maps corresponding to 7 AACS telemetry modes were constructed. These modes are: (1) Record; (2) Nominal Cruise; (3) Medium Slow Cruise; (4) Slow Cruise; (5) Orbital Ops; (6) Av; (7) ATE (Attitude Estimator) Calibration. These 7 maps cover all spacecraft telemetry modes. The Huygens probe, supplied by the European Space Agency (ESA) and named after the 17th century Dutch astronomer who first discovered Titan, Christiaan Huygens, scrutinized the clouds, atmosphere, and surface of Saturn's moon Titan in its descent on January 15, 2005. It was designed to enter and brake in Titan's atmosphere and parachute a fully instrumented robotic laboratory down to the surface. The probe system consisted of the probe itself which descended to Titan, and the probe support equipment (PSE) which remained attached to the orbiting spacecraft. The PSE includes electronics that track the probe, recover the data gathered during its descent, and process and deliver the data to the orbiter that transmits it to Earth. The core control computer CPU was a redundant MIL-STD-1750A control system. The data were transmitted by a radio link between Huygens and Cassini provided by Probe Data Relay Subsystem (PDRS). As the probe's mission could not be telecommanded from Earth because of the great distance, it was automatically managed by the Command Data Management Subsystem (CDMS). The PDRS and CDMS were provided by the Italian Space Agency (ASI). After Cassini's launch, it was discovered that data sent back from the probe to European Space Agency's mission control center was largely unreadable. It was determined that Cassini's receiver was unable to accurately process the changes in frequency and wavelength of the signal it would be receiving from Huygens during its descent to Titan. The problem was rectified by changing the distance and angle of Cassini's trajectory to Huygens during the landing. The Cassini space probe performed two gravitational-assist flybys of Venus on April 26, 1998, and June 24, 1999. These flybys provided the space probe with enough momentum to travel all the way out to the asteroid belt. At that point, the Sun's gravity pulled the space probe back into the inner Solar System. On August 18, 1999, at 03:28 UTC, the craft made a gravitational-assist flyby of the Earth. One hour and 20 minutes before closest approach, Cassini made its closest approach to the Earth's Moon at 377,000 kilometers, and it took a series of calibration photos. On January 23, 2000, Cassini performed a flyby of the asteroid 2685 Masursky at around 10:00 UTC. It took photos in the period five to seven hours before the flyby at a distance of 1.6 million kilometers, and a diameter of 15 to 20 km was estimated for the asteroid. Cassini made its closest approach to Jupiter on December 30, 2000, and made many scientific measurements. About 26,000 images of Jupiter, its faint rings, and its moons were taken during the six-month flyby. It produced the most detailed global color portrait of the planet yet (see image at right), in which the smallest visible features are approximately 60 km (37 mi) across. Cassini photographed Io transiting Jupiter on January 1, 2001. A major finding of the flyby, announced on March 6, 2003, was of Jupiter's atmospheric circulation. Dark "belts" alternate with light "zones" in the atmosphere, and scientists had long considered the zones, with their pale clouds, to be areas of upwelling air, partly because many clouds on Earth form where air is rising. But analysis of Cassini imagery showed that individual storm cells of upwelling bright-white clouds, too small to see from Earth, pop up almost without exception in the dark belts. According to Anthony Del Genio of NASA's Goddard Institute for Space Studies, "the belts must be the areas of net-rising atmospheric motion on Jupiter, [so] the net motion in the zones has to be sinking." Other atmospheric observations included a swirling dark oval of high atmospheric haze, about the size of the Great Red Spot, near Jupiter's north pole. Infrared imagery revealed aspects of circulation near the poles, with bands of globe-encircling winds, with adjacent bands moving in opposite directions. The same announcement also discussed the nature of Jupiter's rings. Light scattering by particles in the rings showed the particles were irregularly shaped (rather than spherical) and likely originate as ejecta from micrometeorite impacts on Jupiter's moons, probably Metis and Adrastea. Although some measurable deviations from the values calculated using the general theory of relativity are predicted by some unusual cosmological models, no such deviations were found by this experiment. Previous tests using radiowaves transmitted by the Viking and Voyager space probes were in agreement with the calculated values from general relativity to within an accuracy of one part in one thousand. The more refined measurements from the Cassini space probe experiment improved this accuracy to about one part in 51,000. The data firmly support Einstein's general theory of relativity. The possible formation of a new moon was captured on April 15, 2013. In total, the Cassini mission discovered seven new moons orbiting Saturn. Using images taken by Cassini, researchers discovered Methone, Pallene and Polydeuces in 2004, although later analysis revealed that Voyager 2 had photographed Pallene in its 1981 flyby of the ringed planet. On May 1, 2005, a new moon was discovered by Cassini in the Keeler gap. It was given the designation S/2005 S 1 before being named Daphnis. A fifth new moon was discovered by Cassini on May 30, 2007, and was provisionally labeled S/2007 S 4. It is now known as Anthe. A press release on February 3, 2009 showed a sixth new moon found by Cassini. The moon is approximately 1/3 of a mile (500 m) in diameter within the G-ring of the ring system of Saturn, and is now named Aegaeon (formerly S/2008 S 1). A press release on November 2, 2009 mentions the seventh new moon found by Cassini on July 26, 2009. It is presently labeled S/2009 S 1 and is approximately 300 m (1000 ft) in diameter in the B-ring system. On April 14, 2014, NASA scientists reported the possible beginning of a new moon in Saturn's A Ring. On June 11, 2004, Cassini flew by the moon Phoebe. This was the first opportunity for close-up studies of this moon (Voyager 2 performed a distant flyby in 1981 but returned no detailed images). It also was Cassini's only possible flyby for Phoebe due to the mechanics of the available orbits around Saturn. The first close-up images were received on June 12, 2004, and mission scientists immediately realized that the surface of Phoebe looks different from asteroids visited by spacecraft. Parts of the heavily cratered surface look very bright in those pictures, and it is currently believed that a large amount of water ice exists under its immediate surface. 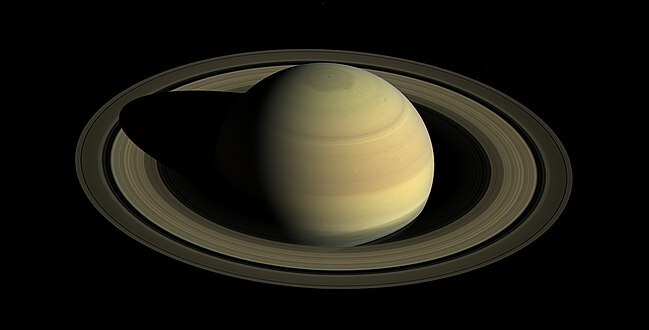 In an announcement on June 28, 2004, Cassini program scientists described the measurement of the rotational period of Saturn. Because there are no fixed features on the surface that can be used to obtain this period, the repetition of radio emissions was used. This new data agreed with the latest values measured from Earth, and constituted a puzzle to the scientists. It turns out that the radio rotational period had changed since it was first measured in 1980 by Voyager 1, and it was now 6 minutes longer. This, however, does not indicate a change in the overall spin of the planet. It is thought to be due to variations in the upper atmosphere and ionosphere at the latitudes which are magnetically connected to the radio source region. Saturn reached equinox in 2008, shortly after the end of the prime mission. On July 1, 2004, the spacecraft flew through the gap between the F and G rings and achieved orbit, after a seven-year voyage. It was the first spacecraft to ever orbit Saturn. The Saturn Orbital Insertion (SOI) maneuver performed by Cassini was complex, requiring the craft to orient its High-Gain Antenna away from Earth and along its flight path, to shield its instruments from particles in Saturn's rings. Once the craft crossed the ring plane, it had to rotate again to point its engine along its flight path, and then the engine fired to decelerate the craft by 622 meters/s to allow Saturn to capture it. Cassini was captured by Saturn's gravity at around 8:54 pm Pacific Daylight Time on June 30, 2004. During the maneuver Cassini passed within 20,000 km (12,000 mi) of Saturn's cloud tops. Cassini had its first flyby of Saturn's largest moon, Titan, on July 2, 2004, a day after orbit insertion, when it approached to within 339,000 km (211,000 mi) of Titan. Images taken through special filters (able to see through the moon's global haze) showed south polar clouds thought to be composed of methane and surface features with widely differing brightness. On October 27, 2004, the spacecraft executed the first of the 45 planned close flybys of Titan when it passed a mere 1,200 kilometers above the moon. Almost four gigabits of data were collected and transmitted to Earth, including the first radar images of the moon's haze-enshrouded surface. It revealed the surface of Titan (at least the area covered by radar) to be relatively level, with topography reaching no more than about 50 meters in altitude. The flyby provided a remarkable increase in imaging resolution over previous coverage. Images with up to 100 times better resolution were taken and are typical of resolutions planned for subsequent Titan flybys. Cassini collected pictures of Titan and the lakes of methane were similar to the lakes of Earth. Cassini released the Huygens probe on December 25, 2004, by means of a spring and spiral rails intended to rotate the probe for greater stability. It entered the atmosphere of Titan on January 14, 2005, and after a two-and-a-half-hour descent landed on solid ground. Although Cassini successfully relayed 350 of the pictures that it received from Huygens of its descent and landing site, a software error failed to turn on one of the Cassini receivers and caused the loss of another 350 pictures. While landing, for caution, NASA loaded Huygens with 3 parachutes. During the first two close flybys of the moon Enceladus in 2005, Cassini discovered a deflection in the local magnetic field that is characteristic for the existence of a thin but significant atmosphere. Other measurements obtained at that time point to ionized water vapor as its main constituent. Cassini also observed water ice geysers erupting from the south pole of Enceladus, which gives more credibility to the idea that Enceladus is supplying the particles of Saturn's E ring. Mission scientists began to suspect that there may be pockets of liquid water near the surface of the moon that fuel the eruptions. On March 12, 2008, Cassini made a close fly-by of Enceladus, passing within 50 km of the moon's surface. The spacecraft passed through the plumes extending from its southern geysers, detecting water, carbon dioxide and various hydrocarbons with its mass spectrometer, while also mapping surface features that are at much higher temperature than their surroundings with the infrared spectrometer. Cassini was unable to collect data with its cosmic dust analyzer due to an unknown software malfunction. On November 21, 2009, Cassini made its eighth flyby of Enceladus, this time with a different geometry, approaching within 1,600 kilometers (990 mi) of the surface. The Composite Infrared Spectrograph (CIRS) instrument produced a map of thermal emissions from the Baghdad Sulcus 'tiger stripe'. The data returned helped create a detailed and high resolution mosaic image of the southern part of the moon's Saturn-facing hemisphere. On April 3, 2014, nearly ten years after Cassini entered Saturn's orbit, NASA reported evidence of a large salty internal ocean of liquid water in Enceladus. The presence of an internal salty ocean in contact with the moon's rocky core, places Enceladus "among the most likely places in the Solar System to host alien microbial life". On June 30, 2014, NASA celebrated ten years of Cassini exploring Saturn and its moons, highlighting the discovery of water activity on Enceladus among other findings. In September 2015, NASA announced that gravitational and imaging data from Cassini were used to analyze the librations of Enceladus' orbit and determined that the moon's surface is not rigidly joined to its core, concluding that the underground ocean must therefore be global in extent. On October 28, 2015, Cassini performed a close flyby of Enceladus, coming within 49 km (30 mi) of the surface, and passing through the icy plume above the south pole. In May 2005, Cassini began a series of radio occultation experiments, to measure the size-distribution of particles in Saturn's rings, and measure the atmosphere of Saturn itself. For over four months, the craft completed orbits designed for this purpose. 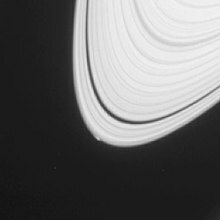 During these experiments, it flew behind the ring plane of Saturn, as seen from Earth, and transmitted radio waves through the particles. The radio signals received on Earth were analyzed, for frequency, phase, and power shift of the signal to determine the structure of the rings. Upper image: visible color mosaic of Saturn's rings taken on December 12, 2004. Lower image: simulated view constructed from a radio occultation observation on May 3, 2005. Color in the lower image represents ring particle sizes. In images captured September 5, 2005, Cassini detected spokes in Saturn's rings, previously seen only by the visual observer Stephen James O'Meara in 1977 and then confirmed by the Voyager space probes in the early 1980s. Ligeia Mare, on the left, is compared at scale to Lake Superior. Titan - Evolving feature in Ligeia Mare (August 21, 2014). Radar images obtained on July 21, 2006 appear to show lakes of liquid hydrocarbon (such as methane and ethane) in Titan's northern latitudes. This is the first discovery of currently existing lakes anywhere besides on Earth. The lakes range in size from one to one-hundred kilometers across. On March 13, 2007, the Jet Propulsion Laboratory announced that it had found strong evidence of seas of methane and ethane in the northern hemisphere of Titan. At least one of these is larger than any of the Great Lakes in North America. In November 2006, scientists discovered a storm at the south pole of Saturn with a distinct eyewall. This is characteristic of a hurricane on Earth and had never been seen on another planet before. Unlike a terrestrial hurricane, the storm appears to be stationary at the pole. The storm is 8,000 kilometers (5,000 mi) across, and 70 kilometers (43 mi) high, with winds blowing at 560 kilometers per hour (350 mph). On September 10, 2007, Cassini completed its flyby of the strange, two-toned, walnut-shaped moon, Iapetus. Images were taken from 1,000 miles (1,600 km) above the surface. As it was sending the images back to Earth, it was hit by a cosmic ray that forced it to temporarily enter safe mode. All of the data from the flyby were recovered. On April 15, 2008, Cassini received funding for a 27-month extended mission. It consisted of 60 more orbits of Saturn, with 21 more close Titan flybys, seven of Enceladus, six of Mimas, eight of Tethys, and one targeted flyby each of Dione, Rhea, and Helene. The extended mission began on July 1, 2008, and was renamed the Cassini Equinox Mission as the mission coincided with Saturn's equinox. A proposal was submitted to NASA for a second mission extension (September 2010 – May 2017), provisionally named the extended-extended mission or XXM. This ($60M pa) was approved in February 2010 and renamed the Cassini Solstice Mission. It included Cassini orbiting Saturn 155 more times, conducting 54 additional flybys of Titan and 11 more of Enceladus. On October 25, 2012, Cassini witnessed the aftermath of the massive Great White Spot storm that recurs roughly every 30 years on Saturn. Data from the composite infrared spectrometer (CIRS) instrument indicated a powerful discharge from the storm that caused a temperature spike in the stratosphere of Saturn 83 K (83 °C; 149 °F) above normal. Simultaneously, a huge increase in ethylene gas was detected by NASA researchers at Goddard Research Center in Greenbelt, Maryland. Ethylene is a colorless gas that is highly uncommon on Saturn and is produced both naturally and through man-made sources on Earth. The storm that produced this discharge was first observed by the spacecraft on December 5, 2010 in Saturn's northern hemisphere. The storm is the first of its kind to be observed by a spacecraft in orbit around Saturn as well as the first to be observed at thermal infrared wavelengths, allowing scientists to observe the temperature of Saturn's atmosphere and track phenomena that are invisible to the naked eye. The spike of ethylene gas that was produced by the storm reached levels that were 100 times more than those thought possible for Saturn. Scientists have also determined that the storm witnessed was the largest, hottest stratospheric vortex ever detected in the Solar System, initially being larger than Jupiter's Great Red Spot. On December 21, 2012, Cassini observed a transit of Venus across the Sun. The VIMS instrument analyzed sunlight passing through the Venusian atmosphere. VIMS previously observed the transit of exoplanet HD 189733 b. On July 19, 2013, the probe was pointed towards Earth to capture an image of the Earth and the Moon, as part of a natural light, multi-image portrait of the entire Saturn system. The event was unique as it was the first time NASA informed the public that a long-distance photo was being taken in advance. The imaging team said they wanted people to smile and wave to the skies, with Cassini scientist Carolyn Porco describing the moment as a chance to "celebrate life on the Pale Blue Dot". On February 10, 2015, the Cassini spacecraft visited Rhea more closely, coming within 47,000 km (29,000 mi). The spacecraft observed the moon with its cameras producing some of the highest resolution color images yet of Rhea. Cassini performed its latest flyby of Saturn's moon Hyperion on May 31, 2015, at a distance of about 34,000 km (21,000 mi). Cassini performed its last flyby of Saturn's moon Dione on August 17, 2015, at a distance of about 475 km (295 mi). A previous flyby was performed on June 16. Between 2012 and 2016, the persistent hexagonal cloud pattern at Saturn's north pole changed from a mostly blue color to more of a golden color. One theory for this is a seasonal change: extended exposure to sunlight may be creating haze as the pole swivels toward the sun. It was previously noted that there was less blue color overall on Saturn between 2004 and 2008. Cassini's end involved a series of close Saturn passes, approaching within the rings, then an entry into Saturn's atmosphere on September 15, 2017, to destroy the spacecraft. This method was chosen because it is imperative to ensure protection and prevent biological contamination to any of the moons of Saturn thought to offer potential habitability. In 2008 a number of options were evaluated to achieve this goal, each with varying funding, scientific, and technical challenges. A short period Saturn impact for an end of mission was rated "excellent" with the reasons "D-ring option satisfies unachieved AO goals; cheap and easily achievable" while collision with an icy moon was rated "good" for being "cheap and achievable anywhere/time". On November 29, 2016, the spacecraft performed a Titan flyby that took it to the gateway of F-ring orbits: This was the start of the Grand Finale phase culminating in its impact with the planet. A final Titan flyby on April 22, 2017, changed the orbit again to fly through the gap between Saturn and its inner ring days later on April 26. Cassini passed about 3,100 km (1,900 mi) above Saturn's cloud layer and 320 km (200 mi) from the visible edge of the inner ring; it successfully took images of Saturn's atmosphere and began returning data the next day. After a further 22 orbits through the gap, the mission was ended with a dive into Saturn's atmosphere on September 15; signal was lost at 7:55:46 AM EDT on September 15, 2017, just 30 seconds later than predicted. It is estimated that the spacecraft burned up about 45 seconds after the last transmission. In September 2018, NASA won an Emmy Award for Outstanding Original Interactive Program for its presentation of the Cassini mission's Grand Finale at Saturn. The final close passes by the rings and planet enabled scientists to measure the length of a day on Saturn: 10 hours, 33 minutes and 38 seconds. Saturn's rings are relatively new, 10 to 100 million years old. They may have formed during the age of dinosaurs on Earth. Last image (color) taken by Cassini as it descended toward Saturn. The image was taken 634,000 km (394,000 mi) above Saturn on September 14, 2017, at 19:59 UTC. Video (03:40) detailing Cassini's Grand Finale mission and a look back at what the mission has accomplished. The spacecraft operation was organized around a series of missions. Each is structured according to a certain amount of funding, goals, etc. 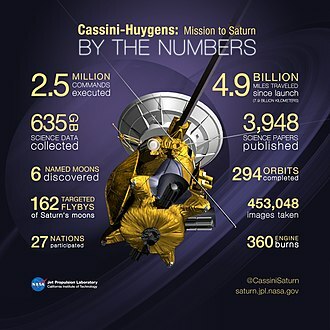 At least 260 scientists from 17 countries have worked on the Cassini–Huygens mission; in addition thousands of people overall worked to design, manufacture, and launch the mission. Prime Mission, July 2004 through June 2008. Cassini Equinox Mission was a two-year mission extension which ran from July 2008 through September 2010. Grand Finale (spacecraft directed into Saturn), April 2017 to September 15, 2017. ^ a b c d "Cassini–Huygens: Quick Facts". NASA. Retrieved August 20, 2011. ^ Krebs, Gunter Dirk. "Cassini / Huygens". Gunter's Space Page. Retrieved June 15, 2016. ^ Barber, Todd J. (August 23, 2010). "Insider's Cassini: Power, Propulsion, and Andrew Ging". NASA. Archived from the original on April 2, 2012. Retrieved August 20, 2011. ^ a b Brown, Dwayne; Cantillo, Laurie; Dyches, Preston (September 15, 2017). "NASA's Cassini Spacecraft Ends Its Historic Exploration of Saturn". NASA. Retrieved September 15, 2017. ^ a b c d Chang, Kenneth (September 14, 2017). "Cassini Vanishes Into Saturn, Its Mission Celebrated and Mourned". The New York Times. Retrieved September 15, 2017. ^ "Cassini Post-End of Mission News Conference" (Interview). Pasadena, CA: NASA Television. September 15, 2017. ^ a b c "Outer Planets Flagship - Science Mission Directorate". NASA. ^ Corum, Jonathan (December 18, 2015). "Mapping Saturn's Moons". The New York Times. Retrieved December 18, 2015. ^ "Saturn Plunge Nears for Cassini Spacecraft". NASA - National Aeronautics and Space Administration. August 29, 2017. Retrieved August 30, 2017. ^ a b Overbye, Dennis (September 8, 2017). "Cassini Flies Toward a Fiery Death on Saturn". The New York Times. Retrieved September 10, 2017. ^ Mosher, Dave (April 5, 2017). "NASA will destroy a $3.26 billion Saturn probe this summer to protect an alien water world". Business Insider. Retrieved May 2, 2017. ^ Chang, Kenneth (May 3, 2017). "The 'Sounds' of Space as NASA's Cassini Dives by Saturn". The New York Times. Retrieved May 3, 2017. ^ "Cassini's First Dive Between Saturn and its Rings". ^ a b c "'Our Saturn years' - Cassini-Huygens' epic journey to the ringed planet, told by the people who made it happen". BBC News. Retrieved September 14, 2017. ^ "Cassini-Huygens". Agenzia Spaziale Italiana. December 2008. ^ Miller, Edward A.; Klein, Gail; Juergens, David W.; Mehaffey, Kenneth; Oseas, Jeffrey M.; et al. (October 1996). "The Visual and Infrared Mapping Spectrometer for Cassini" (PDF). Proceedings of the SPIE: Cassini/Huygens: A Mission to the Saturnian Systems. Cassini/Huygens: A Mission to the Saturnian Systems. 2803: 206–220. Bibcode:1996SPIE.2803..206M. doi:10.1117/12.253421. ^ Reininger, Francis M.; Dami, Michele; Paolinetti, Riccardo; Pieri, Silvano; Falugiani, Silvio; et al. (June 1994). "Visible Infrared Mapping Spectrometer--visible channel (VIMS-V)". Proceedings of the SPIE: Instrumentation in Astronomy VIII. Instrumentation in Astronomy VIII. 2198: 239–250. Bibcode:1994SPIE.2198..239R. doi:10.1117/12.176753. ^ a b Brown, Dwayne; Martinez, Carolina (April 15, 2008). "NASA Extends Cassini's Grand Tour of Saturn". NASA / Jet Propulsion Laboratory. Retrieved August 14, 2017. ^ "Cassini-Huygens mission objectives". March 27, 2012. ^ "Mission Summary". sci.esa.int. Retrieved February 3, 2017. ^ "Cassini Solstice Mission-FAQs". Jet Propulsion Laboratory. Retrieved January 24, 2014. ^ "NASA Extends Cassini Probe's Mission at Saturn". Space.com. April 15, 2008. Retrieved September 1, 2010. ^ Moskowitz, Clara (February 3, 2010). "Cassini Saturn Probe Gets 7-Year Life Extension". Space.com. Retrieved August 20, 2011. ^ Ride, Sally K. (August 1987). Leadership and America's Future in Space (Report). NASA. p. 27. NASA-TM-89638; N87-30248. Archived (PDF) from the original on May 1, 2018. ^ Ip, Wing; Gautier, Daniel; Owen, Tobias (April 16, 2004). The genesis of Cassini-Huygens. Titan - from Discovery to Encounter: International Conference on the occasion of the 375th birthday of Christiaan Huygens. April 13–17, 2004. ESTEC, Noordwijk, the Netherlands. p. 218. Bibcode:2004ESASP1278..211I. ^ Rensberger, Royce (November 28, 1988). "EUROPEANS ENDORSE JOINT SPACE MISSION". Retrieved September 15, 2017. ^ Morgan, Dan (October 18, 1989). "BIG INCREASES APPROVED FOR HOUSING, VETS' CARE". Retrieved September 15, 2017. ^ William J. Broad (September 8, 1997). "Saturn Mission's Use of Plutonium Fuel Provokes Warnings of Danger". The New York Times. Retrieved September 1, 2010. ^ "Dozens arrested in protest of plutonium-fueled space mission". CNN. October 4, 1997. Retrieved September 1, 2010. ^ Christopher Boyd (October 5, 1997). "27 Arrested at Protest of Cassini". Orlando Sentinel. Retrieved September 1, 2010. ^ "Cassini Spacecraft Nears Liftoff, but Critics Object to its Risks". The New York Times. October 12, 1997. Retrieved September 1, 2010. ^ Daniel Sorid (August 18, 1999). "Activists Stand their Ground, Even As Cassini Sails Safely Away". Space.com. Retrieved September 1, 2010. ^ "Cassini spacecraft". European Space Agency. Retrieved April 5, 2018. ^ "Cassini Spacecraft and Huygens Probe" (PDF). NASA/Jet Propulsion Laboratory. May 1999. JPL 400-777. ^ Coustenis, Athena; Taylor, Fredric W. (2008). Titan: Exploring an Earthlike World. Series on Atmospheric, Oceanic and Planetary Physics. 4 (2nd ed.). World Scientific. p. 75. ISBN 978-981-270-501-3. ^ "Signatures from Earth Board Spacecraft to Saturn". Cassini: The Grand Finale. Retrieved October 10, 2017. ^ "616,400 Signatures". Cassini: The Grand Finale. Retrieved October 10, 2017. ^ Overbye, Dennis (August 6, 2014). "Storm Chasing on Saturn". The New York Times. Retrieved August 6, 2014. ^ a b "Cassini: Mission to Saturn: Cassini Orbiter". ^ a b c d e f g h i j k l "Cassini Orbiter Instruments". Saturn.jpl.nasa.gov. Retrieved August 20, 2011. ^ "CAPS team page". Caps.space.swri.edu. Retrieved August 20, 2011. ^ "Cassini Significant Events newsletter 2012 03 26". JPL. Archived from the original on September 12, 2015. Retrieved December 13, 2018. ^ Waite J. H.; Lewis S.; Kasprzak W. T.; Anicich V. G.; Block B. P.; Cravens T. E.; Fletcher G. G.; Ip W. H.; Luhmann J. G.; McNutt R. L.; Niemann H. B.; Parejko J. K.; Richards J. E.; Thorpe R. L.; Walter E. M.; Yelle R. V. (2004). "The Cassini ion and neutral mass spectrometer (INMS) investigation" (PDF). Space Science Reviews. 114 (1–4): 113–231. Bibcode:2004SSRv..114..113W. doi:10.1007/s11214-004-1408-2. ^ "INMS team page". Inms.space.swri.edu. Retrieved August 20, 2011. ^ Porco C. C.; West R. A.; Squyres S.; McEwen A.; Thomas P.; Murray C. D.; Delgenio A.; Ingersoll A. P.; Johnson T. V.; Neukum G.; Veverka J.; Dones L.; Brahic A.; Burns J. A.; Haemmerle V.; Knowles B.; Dawson D.; Roatsch T.; Beurle K.; Owen W. (2004). "Cassini Imaging Science: Instrument characteristics and anticipated scientific investigations at Saturn". Space Science Reviews. 115 (1–4): 363–497. Bibcode:2004SSRv..115..363P. doi:10.1007/s11214-004-1456-7. ^ Dougherty M. K.; Kellock S.; Southwood D. J.; Balogh A.; Smith E. J.; Tsurutani B. T.; Gerlach B.; Glassmeier K. H.; Gleim F.; Russell C. T.; Erdos G.; Neubauer E. M.; Cowley S. W. H. (2004). "The Cassini magnetic field investigation" (PDF). Space Science Reviews. 114 (1–4): 331–383. Bibcode:2004SSRv..114..331D. CiteSeerX 10.1.1.454.6826. doi:10.1007/s11214-004-1432-2. ^ "Mimi Inca". Sd-www.jhuapl.edu. Retrieved August 20, 2011. ^ Krimigis S. M.; Mitchell D. G.; Hamilton D. C.; Livi S.; Dandouras J.; Jaskulek S.; Armstrong T. P.; Boldt J. D.; Cheng A. F.; Gloeckler G.; Hayes J. R.; Hsieh K. C.; Ip W. H.; Keath E. P.; Kirsch E.; Krupp N.; Lanzerotti L. J.; Lundgren R.; Mauk B. H.; McEntire R. W.; Roelof E. C.; Schlemm C. E.; Tossman B. E.; Wilken B.; Williams D. J. (2004). "Magnetosphere imaging instrument (MIMI) on the Cassini mission to Saturn/Titan". Space Science Reviews. 114 (1–4): 233–329. Bibcode:2004SSRv..114..233K. doi:10.1007/s11214-004-1410-8. ^ a b c d e "Why the Cassini Mission Cannot Use Solar Arrays" (PDF). NASA/JPL. December 6, 1996. Archived from the original (PDF) on February 26, 2015. Retrieved March 21, 2014. ^ "Cassini–Huygens:Quick Facts". Saturn.jpl.nasa.gov. Retrieved July 1, 2014. ^ Friedensen, Victoria Pidgeon (1999). "Chapter 3". Protest Space: A Study of Technology Choice, Perception of Risk, and Space Exploration (PDF) (Master of Science thesis). Archived from the original (PDF) on March 6, 2002. Retrieved February 28, 2011. ^ Kan, Edwin P. (November 1994). Process and Methodology of Developing Cassini G&C Telemetry Dictionary (PDF). Third International Symposium on Space Mission Operations and Ground Data Systems. Greenbelt. Archived from the original (PDF) on May 10, 2013. ^ How Huygens avoided disaster, James Oberg, The Space Review, January 17, 2005. ^ "New Cassini Images of Asteroid Available" (Press release). JPL. February 11, 2000. Archived from the original on June 12, 2010. Retrieved October 15, 2010. ^ Hansen C. J.; Bolton S. J.; Matson D. L.; Spilker L. J.; Lebreton J. P. (2004). "The Cassini–Huygens flyby of Jupiter". Icarus. 172 (1): 1–8. Bibcode:2004Icar..172....1H. doi:10.1016/j.icarus.2004.06.018. ^ Bertotti B.; Iess L.; Tortora P. (2003). "A test of general relativity using radio links with the Cassini spacecraft". Nature. 425 (6956): 374–376. Bibcode:2003Natur.425..374B. doi:10.1038/nature01997. PMID 14508481. ^ Spitale, J. N.; Jacobson, R. A.; Porco, C. C.; Owen, W. M., Jr. (2006). "The orbits of Saturn's small satellites derived from combined historic and Cassini imaging observations" (PDF). The Astronomical Journal. 132 (2): 692–710. Bibcode:2006AJ....132..692S. doi:10.1086/505206. ^ "Surprise! Saturn has small moon hidden in ring". NBC News. March 3, 2009. Archived from the original on December 17, 2013. Retrieved August 29, 2015. ^ Daniel W. E. Green (November 2, 2009). "IAU Circular No. 9091". Ciclops.org. Retrieved August 20, 2011. ^ Platt, Jane; Brown, Dwayne (April 14, 2014). "NASA Cassini Images May Reveal Birth of a Saturn Moon". NASA. Retrieved April 14, 2014. ^ Porco C. C.; Baker E.; Barbara J.; Beurle K.; Brahic A.; Burns J. A.; Charnoz S.; Cooper N.; Dawson D. D.; Del Genio A. D.; Denk T.; Dones L.; Dyudina U.; Evans M. W.; Giese B.; Grazier K.; Heifenstein P.; Ingersoll A. P.; Jacobson R. A.; Johnson T. V.; McEwen A.; Murray C. D.; Neukum G.; Owen W. M.; Perry J.; Roatsch T.; Spitale J.; Squyres S.; Thomas P. C.; Tiscareno M.; Turtle E.; Vasavada A. R.; Veverka J.; Wagner R.; West R. (2005). "Cassini Imaging Science: Initial results on Phoebe and Iapetus" (PDF). Science. 307 (5713): 1237–1242. Bibcode:2005Sci...307.1237P. doi:10.1126/science.1107981. PMID 15731440. ^ Carolina Martinez; Gary Galluzzo (June 28, 2004). "Scientists Find That Saturn's Rotation Period is a Puzzle". Jpl.Nasa.Gov. Retrieved August 20, 2011. ^ Porco, Carolyn C. (2007). "Cassini, the first one thousand days". American Scientist. 95 (4): 334–341. doi:10.1511/2007.66.334. ^ "Cassini/Huygens: Heavily Instrumented Flight Systems Approaching Saturn and Titan" (PDF). Archived from the original (PDF) on August 7, 2011. Retrieved August 20, 2011. ^ a b "Spilker_OPAG_0408.ppt" (PDF). Retrieved August 20, 2011. ^ "Huygens Probe Returns First Images of Titan's Surface". Retrieved January 9, 2015. ^ Jia-Rui Cook; Dyawne C. Brown (July 6, 2011). "Cassini Spacecraft Captures Images and Sounds of Big Saturn Storm". Saturn.jpl.nasa.gov. Archived from the original on March 3, 2008. Retrieved August 20, 2011. ^ "Cassini Sends Back Images of Enceladus as Winter Nears". Archived from the original on March 11, 2016. Retrieved December 13, 2018. ^ Amos, Jonathan (April 3, 2014). "Saturn's Enceladus moon hides 'great lake' of water". BBC News. Retrieved April 7, 2014. ^ Iess, L.; Stevenson, D.J. ; Parisi, M.; Hemingway, D.; Jacobson, R.A.; Lunine, J.I. ; Nimmo, F.; Armstrong, J.w. ; Asmar, S.w. ; Ducci, M.; Tortora, P. (April 4, 2014). "The Gravity Field and Interior Structure of Enceladus". Science. 344 (6179): 78–80. Bibcode:2014Sci...344...78I. doi:10.1126/science.1250551. PMID 24700854. ^ Sample, Ian (April 3, 2014). "Ocean discovered on Enceladus may be best place to look for alien life". The Guardian. Retrieved April 3, 2014. ^ Dyches, Preston; Clavin, Whitney (June 25, 2014). "Cassini Celebrates 10 Years Exploring Saturn". NASA. Retrieved June 25, 2014. ^ "Cassini Finds Global Ocean in Saturn's Moon Enceladus". Retrieved September 14, 2015. ^ "Deepest-Ever Dive Through Enceladus Plume Completed". Jet Propulsion Laboratory. October 28, 2015. Retrieved October 29, 2015. ^ Nemiroff, R.; Bonnell, J., eds. (November 27, 2006). "Mysterious Spokes in Saturn's Rings". Astronomy Picture of the Day. NASA. Retrieved December 5, 2013. ^ "Catalog Page for PIA05380: Approach to Saturn". Photojournal.jpl.nasa.gov. NASA Jet Propulsion Laboratory. February 26, 2004. Retrieved August 20, 2011. ^ "The Rings of Saturn". phys.utk.edu. University of Tennessee in Knoxville. Archived from the original on December 12, 2013. Retrieved December 5, 2013. ^ "Cassini Spacecraft Captures Images and Sounds of Big Saturn Storm". Saturn.jpl.nasa.gov. July 6, 2011. Archived from the original on April 30, 2008. Retrieved August 20, 2011. ^ "Cassini-Huygens: News". Saturn.jpl.nasa.gov. Archived from the original on May 8, 2008. Retrieved August 20, 2011. 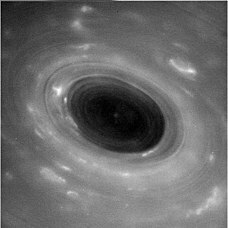 ^ "Huge 'hurricane' rages on Saturn". BBC News. November 10, 2006. Retrieved November 10, 2006. ^ "Cassini Probe Flies by Iapetus, Goes into Safe Mode". Fox News. September 14, 2007. Archived from the original on October 21, 2012. Retrieved September 17, 2007. ^ "Cassini's Tour of the Saturn System". Planetary Society. Archived from the original on April 25, 2009. Retrieved February 26, 2009. ^ "Cassini To Earth: 'Mission Accomplished, But New Questions Await!'". Science Daily. June 29, 2008. Retrieved January 5, 2009. ^ John Spencer (February 24, 2009). "Cassini's proposed extended-extended mission tour". Planetary.org. Retrieved August 20, 2011. ^ "NASA - NASA Spacecraft Sees Huge Burp At Saturn After Large Storm". ^ a b c "Cassini Instrument Learns New Tricks". ^ a b Overbye, Dennis (November 12, 2013). "The View From Saturn". The New York Times. Retrieved November 12, 2013. ^ "Cassini probe takes image of Earth from Saturn orbit". BBC News. July 23, 2013. Retrieved July 24, 2013. ^ "Smile! Cassini sets up photo of Earth". BBC News. July 19, 2013. Retrieved July 24, 2013. ^ "Saturn Tour Dates: 2015". NASA / Jet Propulsion Laboratory. 2015. Archived from the original on May 18, 2015. Retrieved May 2, 2017. ^ "Return to Rhea (NASA Cassini Saturn Mission Images)". Cassini Imaging Central Laboratory for Operations. March 30, 2015. PIA19057. 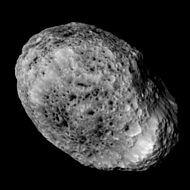 ^ "Cassini Prepares for Last Up-close Look at Hyperion". NASA / Jet Propulsion Laboratory. May 28, 2015. Retrieved May 29, 2015. 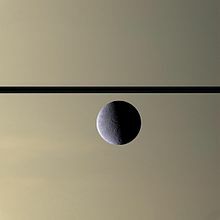 ^ "Cassini to Make Last Close Flyby of Saturn Moon Dione". NASA / Jet Propulsion Laboratory. August 13, 2015. Retrieved August 20, 2015. ^ a b "Changing Colors in Saturn's North". ^ a b Spencer, John (February 24, 2009). "Cassini's Proposed Extended-Extended Mission Tour". The Planetary Society. ^ Blabber, Phillipa; Verrecchia, Angélique (April 3, 2014). "Cassini-Huygens: Preventing Biological Contamination". Space Safety Magazine. Retrieved August 1, 2015. ^ a b Bailey, Frederick; Rabstejnek, Paul. "Cassini Mission and Results". Oglethorpe University. Archived from the original on February 19, 2008. ^ "2016 Saturn Tour Highlights". ^ Lewin, Sarah. "Cassini Mission Kicks Off Finale at Saturn". Scientific American. Retrieved November 30, 2016. ^ Dyches, Preston; Brown, Dwayne; Cantillo, Laurie (April 27, 2017). "NASA Spacecraft Dives Between Saturn and Its Rings". NASA / Jet Propulsion Laboratory. Retrieved May 2, 2017. ^ McGregor, Veronica; Brown, Dwight; Wendel, JoAnna (September 10, 2018). "And the Emmy goes to: Cassini's Grand Finale". NASA. Retrieved September 10, 2018. 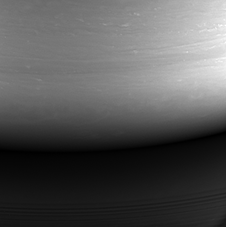 ^ "Overview | Cassini". Solar System Exploration: NASA Science. Retrieved January 25, 2019. ^ Loff, Sarah (September 15, 2017). "Impact Site: Cassini's Final Image". NASA. Retrieved September 17, 2017. ^ a b c d "Cassini Equinox Mission". European Space Agency. October 18, 2011. Retrieved April 15, 2017. ^ "Cassini: Mission to Saturn: The Team". NASA. ^ "Cassini Tour of Saturn and its Moons". European Space Agency. October 7, 2008. Retrieved April 15, 2017. ^ "Start of the Cassini Equinox Mission". European Space Agency. June 30, 2008. Retrieved April 15, 2017. ^ a b "The Grand Finale Toolkit". NASA. Retrieved April 15, 2017. Ralph Lorenz (2017). NASA/ESA/ASI Cassini-Huygens: 1997 onwards (Cassini orbiter, Huygens probe and future exploration concepts) (Owners' Workshop Manual). Haynes Manuals, UK. ISBN 978-1785211119. Karl Grossman (1997). The Wrong Stuff: The Space Program's Nuclear Threat to Our Planet. Common Courage Press. ISBN 978-1-56751-125-3. David M. Harland (2002). Mission to Saturn: Cassini and the Huygens Probe. Springer-Verlag. ISBN 978-1-85233-656-1. Ralph Lorenz; Jacqueline Mitton (2002). Lifting Titan's Veil: Exploring the Giant Moon of Saturn. Cambridge University Press. ISBN 978-0-521-79348-3. Meltzer, Michael (2015). The Cassini-Huygens Visit to Saturn: A Historic Mission to the Ringed Planet. Cham: Springer International Publishing Switzerland. ISBN 978-3-319-07608-9. Irene Klotz (August 31, 2017). "Cassini's Ringside Seat At Saturn Coming To An End". Aviation Week & Space Technology. An epic journey of discovery at Saturn ends, leaving mysteries for future explorers. 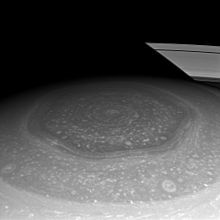 Wikimedia Commons has media related to Cassini-Huygens.